This book was a fun and entertaining read. To save money, a corporation decides to train convicts to be the first exploratory crew on Mars. It is a one way trip. Their purpose is to build and set-up the living quarters for the NASA scientists that follow and then be the maintenance crew for the station. Except that once they get to Mars, they start to die one by one and it doesn’t seem to be an accident. Frank – I very much enjoyed Frank as the primary perspective. He does not always make the best decisions (i.e. why he went to jail) but he is intelligent and likeable. I was certainly rooting for him. Concepts- I loved the idea that the subcontractors are trying to save money and use the convicts and other horrible ideas to stay under budget. Characters – In general, I liked all the other convicts. They are not really fleshed out at all but I enjoyed all of them in various ways. Mars – I liked the descriptions of the planet and the science of the set up of for the dwelling fabrications. It makes me realize, yet again, that I am not meant to ever be a space explorer. I will stick to the sea! Build-Up – this is a slow build-up book with a lot of training and introduction. It takes a decent amount of time to even get to Mars. Now I love this kinda start but others may not. It was a fast read even with the slow build-up. Writing Style – I enjoyed the author’s writing and manner of speech. Mystery – The book claims to have one. It is no mystery. Even though I didn’t know it was supposed to be a who-dun-it tale, the bad guy and the set-up were obvious from the start. Bad-Guy – A boring cookie cutter two-dimensional figure. So very stereotypical. Characters – I would have liked more insight into each of the characters rather than just seeing them as generic “types.” But as they are only seen through Frank’s eyes, it wasn’t a major problem. Mars – There is not much description of the planet itself or really what it feels like to live there. The danger of oxygen loss is the most prevalent danger. Besides murder of course! Epistolary Prologues to the Chapters – These were short segments like transcripts, documents, etc. from the XO Corporation that were interspersed between chapters. I enjoyed some of them but they didn’t appear to be in order and were such small snippets. Many were just confusing. I did want the information about why and how XO made its choices but don’t know if it would have been better served in their own chapters or as an appendix or short story or something. Ending – an abrupt set-up for the sequel. It annoyed me that it stopped there but I still want to know what happens next! This is a light thriller read with very little mystery but is fluffy good entertainment. A very quick, likeable read but nothing earth-shattering (Hardy har har!). I will likely pick up the sequel. 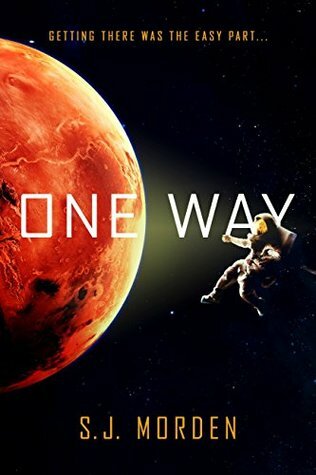 ONE WAY opens at the dawn of a new era – one in which we’re ready to colonise Mars. But the contract to build the first ever Martian base has been won by the lowest bidder, so they need to cut a lot of corners. The first thing to go is the automatic construction… the next thing they’ll have to deal with is the eight astronauts they’ll sent up to build it, when there aren’t supposed to be any at all. Frank – father, architect, murderer – is recruited for the mission with the promise of a better life, along with seven of his most notorious fellow inmates. As his crew sets to work, the accidents mount up, and Frank begins to suspect they might not be accidents at all. As the list of suspects grows shorter, it’s up to Frank to uncover the terrible truth before it’s too late. Wait, there’s actually going to be a sequel? Huh. I thought it was a one-and-done. I did too at first but apparently not. I was interested in readin’ the sequel. We shall see if that remains the case. Thanks for visiting and the comment! I hope me review didn’t make ye nervous about reading it. It was a fun read despite some of the issues I had. My review of One Way is scheduled for tomorrow, and it’s amazing how we hit upon the same pros and cons. I loved Frank! But the other characters were so bland and stereotypical that when they died, I found it hard to care. And the mystery was also lacking in the second half, which was disappointing seeing this was billed as a sci-fi mystery thriller. Still was a solid read overall though, and I enjoyed it even if it could have been better. Thanks matey! Ye gonna read this one? Awesome review! It sounds interesting and the cover grabs me.❤ Have a wonderful week! The cover grabbed me too . . . as usual! Here’s a mug of grog to a good week for me and me crew!